On arrival day, head up to Thunderstik Lodge to check in and get licenses for the hunt. The weather in Chamberlain, SD changes with the season. Expect temperature ranges to vary from 25F to 75F. It is recommended to check the weather channel link prior to your departure to determine your weather conditions. If you are flying commercially Sioux Falls(FSD) is the closest airport. You can rent a car and drive the 2 hours to the lodge or we can pick up your group for a $300 transfer fee. Rental Guns can be provided for $25 per gun - Let the lodge know in advance if you would like to rent a gun. No need to purchase a license in advance of your hunt. 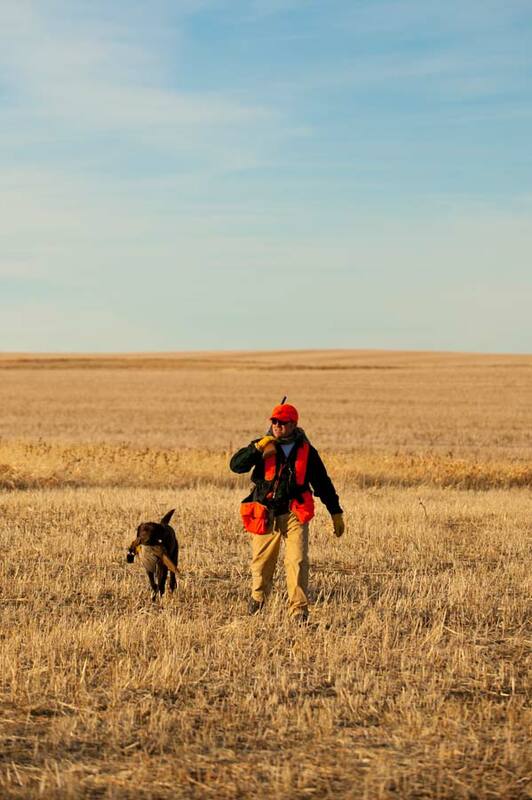 You can purchase a 3 day South Dakota pheasant hunting preserve license at the lodge. How should we handle gratuities? The Rooster Ridge staff work very hard to give you the best possible experience. Please give all cash tips directly to your guide as it means a lot to them. If you want to put the gratuity on a credit card or personal check please do that through the office. Tips for guides range from $200 - $300 per gun and staff tips average around $100 per gun. Staff tips should be given to your host and will be divided between chef, housekeepers and others directly involved with your hunt. Dogs are welcome at the lodge and the Thunderstik guides love to have some extra hunters to mix in with the Thunderstik crew. We can provide accommodations for your dogs but make sure to let us know you are planning to bring them when you submint your registration form. Most hunters bring their favorite shotgun for the hunt but we have very nice lodge guns available if you would like to rent a gun. Interested in shipping your shotgun to the lodge? Give us a call and we can assist you in having your shotgun shipped to the lodge prior to your hunt. Before the hunt, take a couple of minutes to fill out the Rooster Ridge registration form. This will allow us to purchase your license before you arrive and give you the opportunity to tell us about any special needs or requests you have. The number directly to the Lodge is 605-234-5106. 1. Always carry your gun with the safety on until you lift the gun to shoot. 2. Always immediately empty your gun and open the action or chamber at the end of each field and before entering a vehicle. 3. Always wear an orange cap and safety glasses. 4. Always make sure that you have the right gauge shells for your gun. 5. Always keep a straight line when walking through fields. 6. When blocking, always remain within sight of walkers so they know where you are. 7. Always inform the guide of any problems you are having with your gun. 8. Always inform your guide of any health problems that you might have so that he can station you accordingly: if you have a health problem arise during the hunt immediately tell the guide. 1. Don’t consume any alcohol of any sort before or during the hunt. 2. Don’t enter a vehicle with a loaded gun. 3. Don’t point a gun, whether loaded or not, at any person or one of the dogs. 4. Don’t shoot toward a hunter, dog, building, vehicle, or farm machinery. 5. Don’t attempt to fix a jammed shotgun without the assistance of your guide. 6. Don’t shoot pheasants on the ground or that get up behind or among the walkers. 8. Don’t shoot a hen pheasant ($120.00 fine, payable to Game, Fish and Parks after the hunt). Guides are to recover illegally taken game and report the violator to the lodge manager and will then be reported to GF&P. 9. Don’t shoot at low flying birds or birds headed toward blockers. A. When a bird is downed, mark where it lands. If the dog is not in the immediate area, wait for instructions from the guide. If the dog proceeds directly to the bird area, all hunters in line should stop and wait until the dog has hunted the area and finds the bird. If the dog does not find the bird, the dog handler should proceed to the bird fall and direct his dog appropriately. All other hunters should remain in place until the bird is found or the dog handler gives up. B. Do not yell at or attempt to direct the dog. Remain quiet and let the dog and guide do their job. C. Do not attempt to take a bird from a dog. Most dogs are trained to retrieve only to their owner/handler and may bite anyone who attempts to take their retrieved prize. D. DO NOT SHOOT ANYTHING ON THE GROUND, it may be the dog.